Last weekend got off to a great start thanks in part to this cake. It's nice to just block out all the news in the world, sit down, and have a slice of chocolate cake with your loved ones. I hope this might inspire you to whip up a cake (chocolate or otherwise...) for the next weekend, or some weekend this summer! Enjoy it with fresh berries, or just with a cup of tea or coffee. I highly recommend it! Make cake: Grease two 6-inch round cake pans and line the bottom with a round of parchment, also greasing the parchment. Preheat oven to 300 degrees. In the bowl of a stand mixer, beat the egg on medium speed until pale yellow, about 1 minute. Add oil, yogurt, and vanilla, beating well. Gradually pour in the melted coffee and chocolate mixture and beat to combine. Add the dry ingredients all at once and beat on low speed until the batter is just combined. Scrape down the the sides and bottom of the bowl and stir the batter around briefly to make sure all ingredients have been incorporated together. Divide batter into the two prepared cake pans, smoothing the tops. Bake for approximately 35-40 minutes, or until a toothpick inserted into the cake comes out clean. Let the cakes cool in their pans for about half an hour before turning them out and cooling completely on a wire rack. Make ganache: Place chocolate into a heat-proof bowl. Heat cream and corn syrup until it just comes to a boil and pour over the chocolate. Let sit for a minute, then whisk together until combined and smooth. Let the mixture sit and cool, whisking occasionally, until ganache thickens into a consistency you can spread over the cake (you can place it in the refrigerator, checking on it and stirring occasionally, to speed up the process). Assemble cake: Place one cake layer onto a serving plate and tuck small strips of parchment paper under the cake for easy clean up later. Spread about 1/3 of the ganache evenly over cake. Place the second cake layer on top. Frost the entire cake with the remaining ganache. Remove the parchment paper. Slice, plate, and enjoy with some fresh berries, or a cup of coffee or tea! Coffee and chocolate are amazing together! This chocolate looks so chocolatey, luscious and tempting! A chocolate cake sounds like such a great start to the weekend! This looks delicious! I love the yogurt and coffee in here! 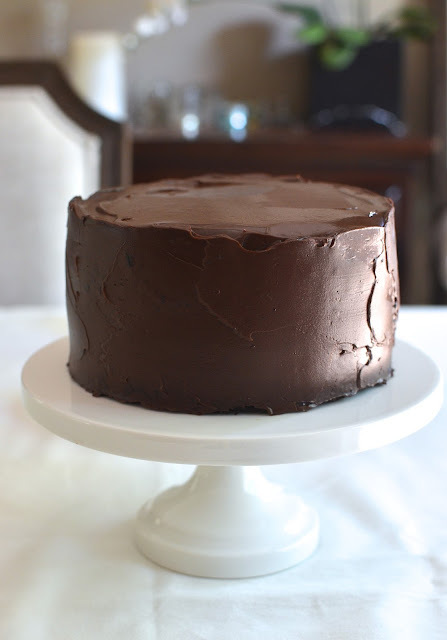 The chocolate ganache frosting looks so so creamy and perfect! I'm still thinking about this cake...a little slice for dessert really hit the spot for a couple of evenings. : ) Here's to the next weekend, Kelly! Wow, this is just decadently delicious looking chocolate cake. Those raspberries on the side are saying hello to me and I just want to eat it. I know - it does look crazy dark and decadent, doesn't it? : ) I think a small slice with plenty of berries on the side is a great balance. I've had chocolate cake on my mind for a long time and keep thinking I should make one for my summer birthday. This is a must try recipe for me - it's so gorgeous and must be absolutely delicious. It's been years since I had a slice of cake that beautiful. Thanks for the inspiration Monica! You are very kind, Tricia! Thank you. Happy upcoming birthday! I'm surprised you are craving chocolate vs. one of your delicious fruit pies, let's say. : ) I'm happy to hear it because I also have a summer birthday and I will definitely be eating chocolate cake. Let's be sure to enjoy ourselves. Thanks again! I love when cleaning out the fridge results in something this delicious! And I'm pretty sure that chocolate cake makes just about everything better! haha This cake is gorgeous! Thank you, Ashley. I love when I actually use up all, or nearly all, of my ingredients from the fridge! And this cake was just what I needed! Chocolate cake? Yes, please. Love chocolates like anything, so I can have chocolate desserts any day. Your cake looks so pretty and decadent. Coffee shines chocolate flavor. And addition of yogurt sounds like a great idea, Monica. I wish I could have a HUGE slice tight away. I totally agree about coffee and chocolate and yogurt gives cakes such an interesting texture...it's like dense yet super moist. Really hit the spot. haha - yes! A nice sit down with a slice of chocolate cake is just the ticket. : ) Thanks! 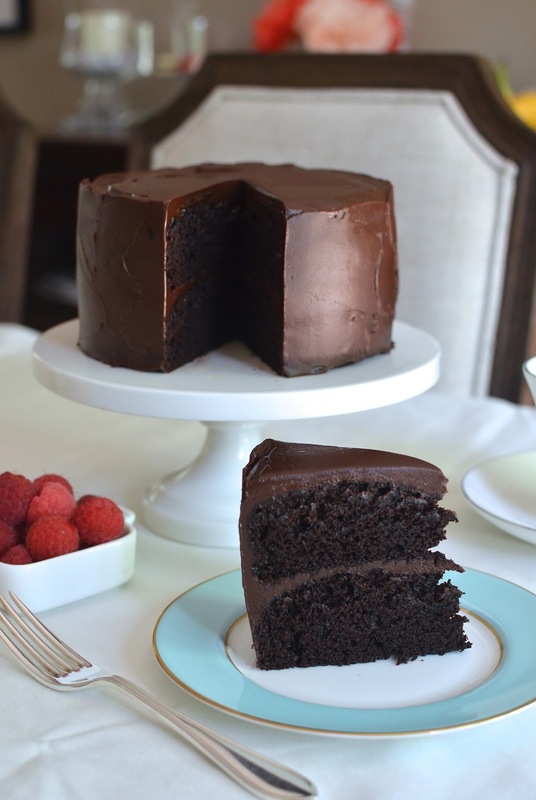 Oh Monica, you chocolate cake looks so pretty, elegant with the dark chocolate color. I love the combination of coffee and chocolate. I would love to have a slice of this cake. Thanks, Juliana. I really enjoyed making it and enjoyed eating it even more! Hi Monica, this has to be one of the prettiest cakes that you've baked, such a beautiful cake stand too, love how you frosted it!! Have a wonderful week-end! A simple clean frost around a cake is pretty much the best I can do. : ) I'm glad you like it...I wish I still had a slice right now. Enjoy the rest of the weekend! You are a professional frosting application guru! If we tried that we would have chocolate everywhere... Gorgeous looking decadent cake! Everyone must know my limitations so you guys are thrilled I was able to keep this simple frosting fairly neat? ; ) Cake was really tasty and I'm craving it again these days. Hi Cathleen - thank you! I love how simply dark and chocolaty it is. It's right up my alley. I think your chocolate cake looks gorgeous, this is such a great way to start the weekend! I must disagree with the berries. A cake this splendid deserves a glass of ice cold milk! Chocolate is my favorite anything!